Askboth is a new search engine that will help you to search details in Google and Bing at same time. Askboth provides image search in Google and Bing. When you start a search askboth divide two parts one is Google and other is Bing. This website is very help for seo tool because it allows you to compare the results in Google and Bing. The main disadvantage of askboth is cannot provide more searches details in Bing. It allows you first page's result only. In Google part askboth provide better result. The result will appear page by page. 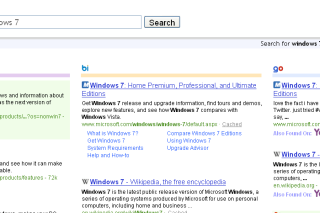 It is sad that it doesn’t support turing pages in bing. Now the Bing colum has pagination since the last two days!